Poppy Day, when the South African Legion holds a street collection to gather funds to assist in the welfare work among military veterans, takes place on the Saturday nearest to Remembrance Day. When one buys a poppy on Poppy Day one pays tribute to those who died, and one is helping those who are left and bear the scars of war. During the First World War (1914–1918) much of the fighting took place in Western Europe, mainly in France and Belgium. The rolling plains of the Somme in France and around Ypres in Belgium was transformed into a network of dug trenches and fortifications as two massive armies stood in opposition to one another. This stunning countryside was blasted, bombed with such ferocity that it became a muddy, treeless barren landscape – a living hell. Only one plant survived – Bright red Flanders poppies (Papaver rhoeas) with their delicate but resilient flowers – and they flourished in their thousands amid the mud and shattered earth. 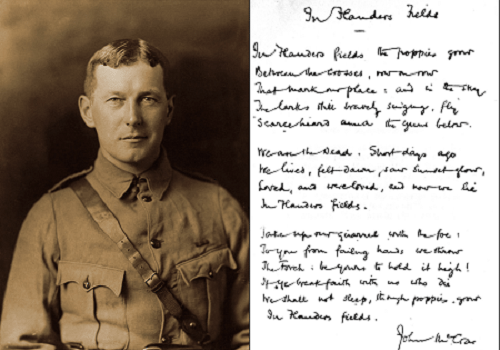 In May 1915, a Canadian doctor, Lt Col John McCrae was so inspired by the sight of poppies growing from the rapidly interned soldiers graves amid all the destruction that he penned his famous poem called ‘In Flanders Fields’. Initially crumpling up the poem and throwing it away, his men found it and urged him to send it to newspaper and magazine publishers, the rest is a remarkable twist of history. Once published in public domain John McCrae’s poem in turn inspired an American academic, Moina Michael to make and sell red silk poppies which were then brought to England to raise funds and help returning veterans and their families with employment, medical aid, housing etc. The (Royal) British Legion, ordered millions of the poppies which were sold during the very first armistice day commemorations on 11 November. This practice was also adopted by the Legion family the world over, including The South African Legion, and continues to this day.